Ready to save time and money and avoid the bid process when buying apparatus? Want to ensure that the apparatus you want is exactly what you will receive? SUTPHEN is pleased to be one of the few apparatus builders to be a part of FireRescue GPO, a new program of NPPGov, a national cooperative purchasing organization. Members have access to publicly solicited contracts specific to their industry, saving time and money in the procurement process. FireRescue GPO operates in partnership withWestern Fire Chiefs Association who manages the FireRescue Advisory Council and a revenue sharing program with the International Association of Fire Chiefs, their Divisions and the State Chiefs Associations. Competitively bid agreements are publicly solicited and awarded through a Request for Proposal (RFP) issued by a Lead Public Agency. 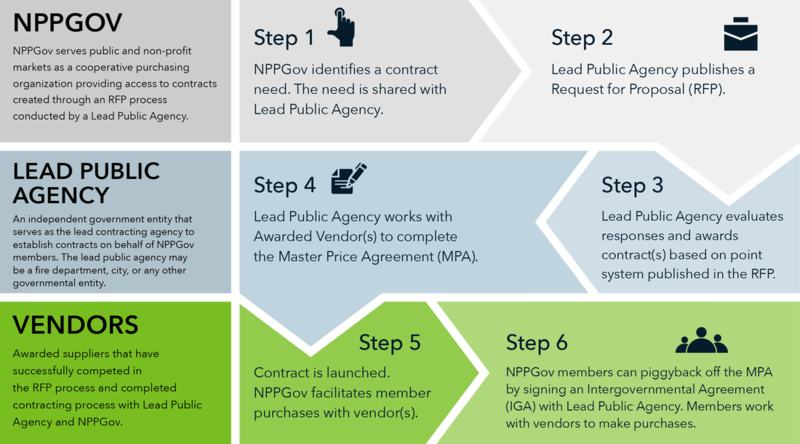 National Purchasing Partners serves as a nationwide channel to offer publicly awarded agreements to public entities.